Bad Mom, Good Mom: How sticky is it? I don't want to hear about how it is not that bad compared to Miami. I didn't move to Miami for a reason. 76F and over 80% relative humidity, ick. What about the cooling sea breeze every afternoon? Nonexistent. The land-sea breeze is driven by the temperature contrast between the ocean and land. Check out this animation. 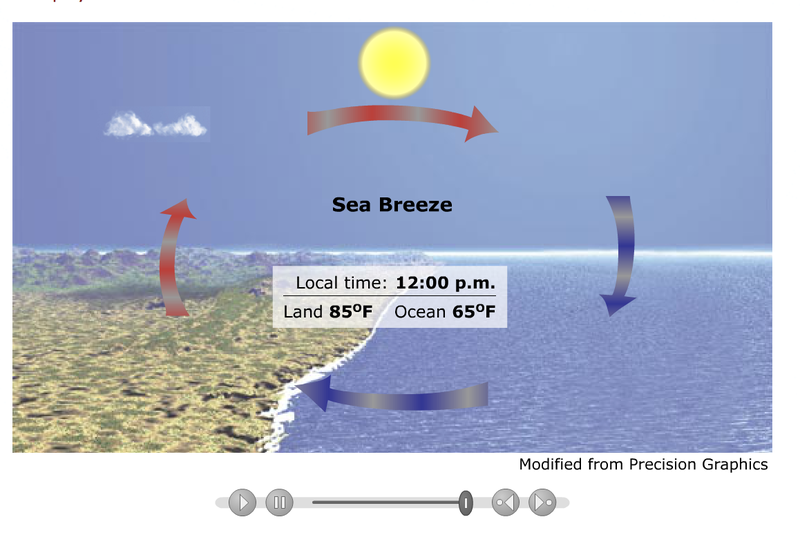 If the ocean is warmer than usual, the sea breeze weakens. Right now, the sea surface temperature (SST) anomaly (difference from average temperature over many years for the same date) is about 3 C or 5 F warmer than usual. 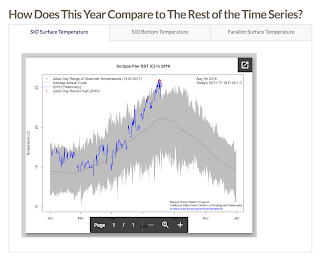 The ocean is about 22 C or about 71 F.
In fact, the SST at the Scripts Institute of Oceanography in San Diego is the highest in their recorded history. 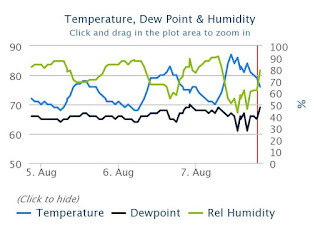 I used this handy dandy relative humidity-dewpoint calculator to plug in my bedroom measurement of 84% and 76 F and got a dew point temperature of 72 F. Coincidentally, that's almost the SST offshore. In conclusion, it's not as hot as it was in early July. But the humidity is higher and my misery is just as high. I'm going to take a cool shower and then settle back with a book (Lightning Men) and an iced drink. PS 5 years ago, we replaced our dark asphalt composite shingle roof with a highly reflective glass composite "cool" roof. 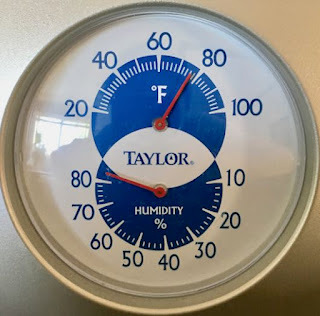 It made a difference and we patted ourselves on the back for not installing air conditioning, which would have cooled our home down, but heated up the planet overall (pesky thermodynamics.) But now I'm regretting that. As long as people are driving long distances in huge vehicles and eating tons of meat (paleo diet, I hate you!) I might use AC. 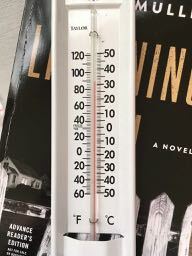 I am so tired of the heat, even as I acknowledge that where I live is not all that hot in the grand scheme of things. Our whole house fan has been wonderful in cooling our house down to an acceptable temperature during the evening hours. It is using energy, but not *that* much - we ran it on high pretty much non-stop every night in July, and it only added $50 to our electric bill. If it were a more normal year, we'd probably only be running it for a few hours a night, or running it on low (when it supposedly uses only as much energy as a light bulb). 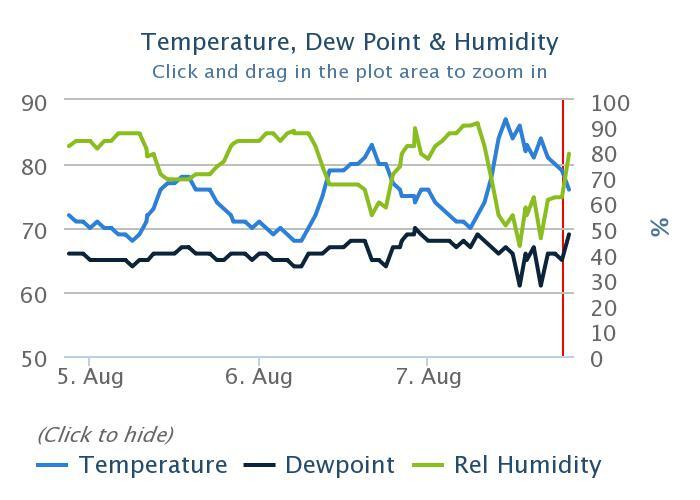 Between your humidity and my neighbor's memory of living in wild fire territory in Colorado, I vow not to whine about it being 90F and distance forest fire hazy in Seattle again today. The loss of the onshore flow is sad. So much of (at least Western) Los Angeles has never had to air condition, as they could count on that and the archtecture that has taken advantage of that steady supply of cool air. A quick check on electricity sources show ---I am so spoiled by our fish killing hydroelectric dams -- up to 60% generated by coal burning. Ouch. Assuming that's higher efficiency now. Hoping that is. Even moving hot air feels better than not. She said hopefully. Comments are open for recent posts, but require moderation for posts older than 14 days.